It's that time of the year again — Brewfest is upon us. With this in-game holiday comes a neat little elemental pet. Join us as we indulge in many mugs of hearty Thunderbrew Stout and drunkenly ponder, 'Could beer be the fifth element?' This month we're covering the Stout Alemental! 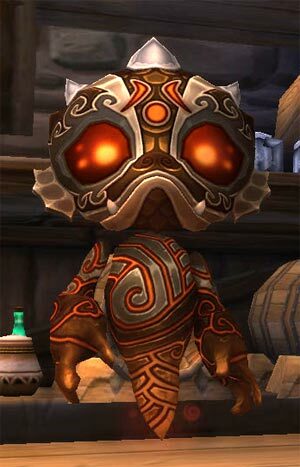 The Stout Alemental is a battle pet that is purchasable during the Brewfest in-game event from Belbi Quikswitch (A) in Dun Morogh or Bliz Fixwidget (H) in Durotar. This pet costs 200 Brewfest Prize Tokens. To collect enough tokens to purchase this pet, there are the three introductory quests, a one time quest dropped by the holiday boss, Coren Direbrew, plus the reward satchel for defeating Direbrew each day that award Brewfest Prize Tokens. Another source of tokens are the Brewfest dailies. There are two dailies, This One Time, When I Was Drunk... and Bark for [...]. Completing these award a set number of tokens daily. The biggest Brewfest Prize Token payout is from a fun Ram Racing mini-game. You can earn a varying amount depending on how well you can handle your Brewfest Ram. No time to participate during Brewfest? The Stout Alemental is Bind On Use and cageable, so it can sometimes be found on the Auction House during the off-season. The Stout Alemental is a versatile battler with seasonal appeal. It's an elemental but most of its abilities are Aquatic. Explosive Brew is its only real elemental ability. A delay nuke on one target does not a robust offense make, however. In terms of offense, there are two other mean options. Brew Bolt is a bread and butter Aquatic filler move. Easy to use, no frills. Barrel Toss is a bit trickier as a delayed nuke, but it does more damage in a single attack — something to be wary of with all those tricky Magic pets out there. The Stout Alemental does have another source of DPS output. Dive is more notable for its avoidance capability, however. The rest of the Alemental's moves also suit this purpose. Bubble blocks two attacks, making it more desirable than Dive in certain situations. The last ability in this Alemental's moveset, Inebriate (pictured above), can also be counted as an avoidance ability. Inebriate decreases your opponent's hit chance by 25%, a great deal, but that leaves both sides vulnerable to RNG. The Stout Alemental is a great pet in some diverse situations, including those times when you need a wingman. Well now I have Pink Elephants on Parade stuck in my head! I think I'll pick up a couple extra of these fellows if I have time. It will be tight with timewalking going on too!